Surveys of corporate executives by two professional services consultancies this week revealed enterprises are on the path to deploying blockchain ledgers for business automation and transaction efficiency. 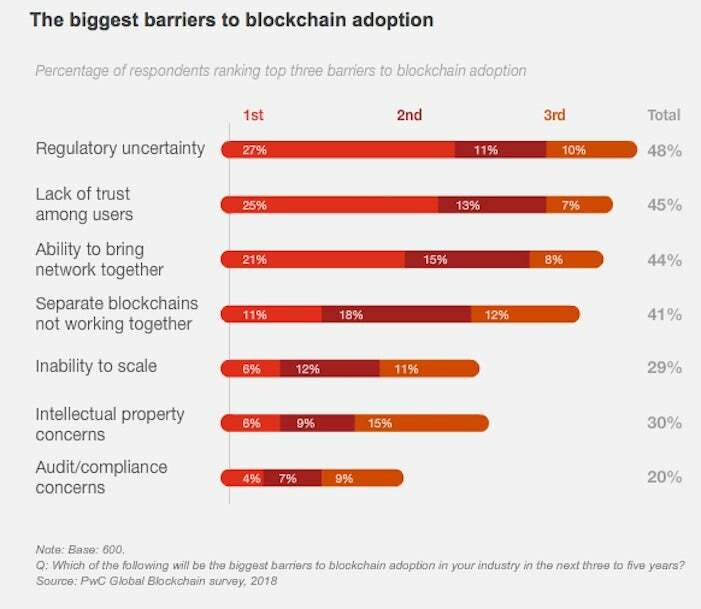 The survey reports, from PwC (PricewaterhouseCoopers) and Deloitte, showed that thousands of respondents are running blockchain projects, and as many as one in three already have it in production. PwC's report, published on Monday, revealed that 84% of 600 executives surveyed indicated their companies are "actively involved" with blockchain: 20% are in the research phase, 32% are in development mode, 10% are in pilot with the technology, 15% are running production blockchain ledgers, and 7% have paused their projects. The remaining 14% indicated they are not involved with blockchain technology. On Tuesday, Deloitte published its survey results, showing that nearly three-quarters (74%) of respondents reported their organizations see a "compelling business case" for the use of blockchain, and many of the companies are moving forward with the distributed ledger technology. 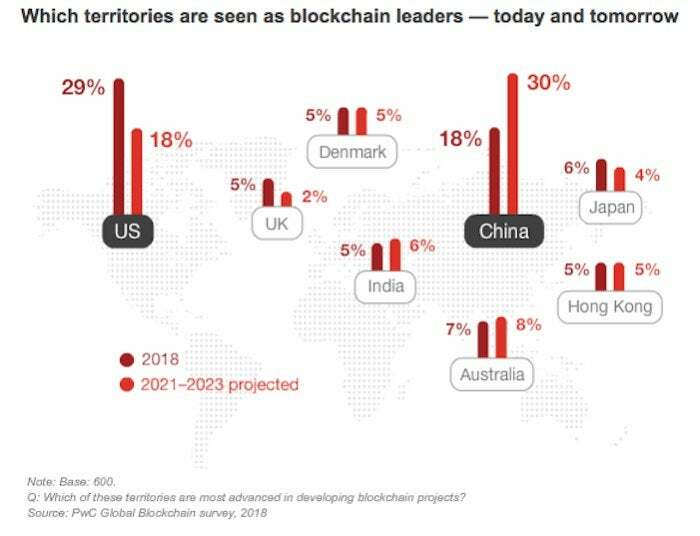 Thirty-four percent indicated that their company already has a blockchain system in production, while another 41% said they expect their organizations to deploy a blockchain application within the next 12 months. Deloitte polled 1,053 "blockchain savvy" executives at companies with $500 million or more in annual revenue. The survey spanned seven countries: Canada, China, France, Germany, Mexico, the U.K., and the U.S.
"As more organizations put their resources behind this emerging technology, we expect blockchain to gain significant traction as its potential for greater efficiency, support for new business models and revenue sources, and enhanced security are demonstrated in real-world situations," Deloitte stated in its report. 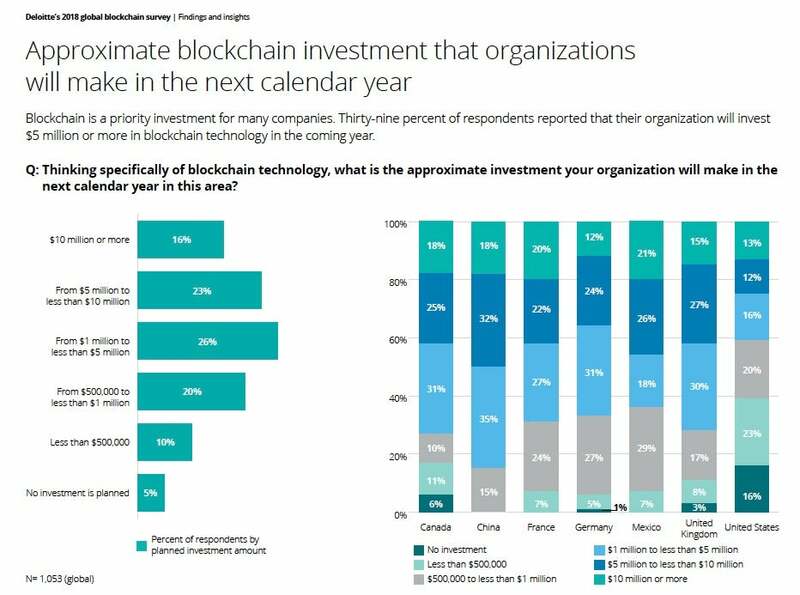 When it comes to the price tag for deploying blockchain, 40% of respondents said their organization will invest at least $5 million in blockchain deployments in the coming year. Forty-five percent of PwC survey respondents, who came from 15 "territories," said a lack of trust in blockchain's capabilities and regulatory uncertainty could delay its adoption. "Users must build confidence in the technology itself. As with any emerging technology, challenges and doubts exist around blockchain's reliability, speed, security and scalability. And there are concerns regarding a lack of standardization and the potential lack of interoperability with other blockchains," PwC's report stated. Earlier this month, the U.S. Treasury released a report urging state and federal regulators to revamp outdated statutes and support technological innovations such as AI, machine learning and blockchain that could make the U.S. financial system more nimble and competitive. Uncertainty aside, PwC pointed to research showing that blockchain is a technology headed for a multi-trillion-dollar valuation over the next decade or so. The firm cited a 2017 Gartner forecast that predicted blockchain would generate an annual business value of more than $176 billion by 2025 and more than $3 trillion by 2030. "It's possible to imagine that 10% to 20% of global economic infrastructure will be running on blockchain-based systems by that same year," PwC stated. "Everyone is talking about blockchain, and no one wants to be left behind."